So here I am, sitting in a coffee shop, stuck, as my car decided to die on me today. So here I wait and wait and wait. 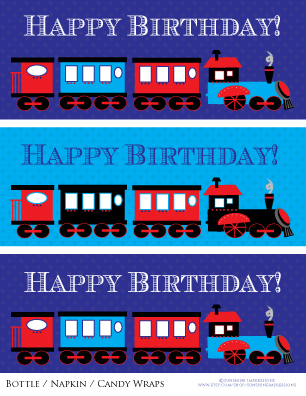 Not one to waste the opportunity, I pull out my computer and start working on my Choo Choo Train Birthday Party Pack that has been put on the back burner due to other more pressing projects. It is definitely serendipitous that I have found this cozy little place as it seems this particular coffee shop is a magnet for new moms with their kids – it has been overflowing with little energy, giggles and movement. The two moms sitting next to me just finished a conversation regarding what their little ones were currently in to. One mom said that her son was crazy about trains – Could I be so lucky? What a sneaky way to learn that the designs I am choosing are really ones that the little people will appreciate and the mom’s too! Here are a couple samples from my new party pack. 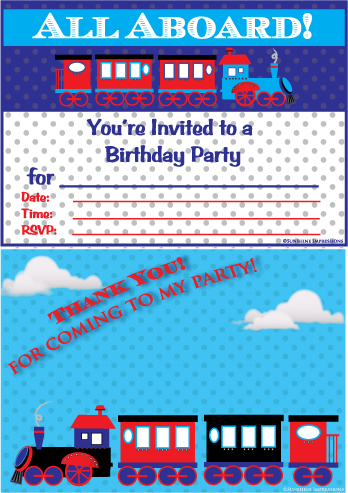 Check out the whole party pack at my Etsy site: Sunshine Impressions – Then download and get your Choo Choo party started! I just got the call – my car is ready! Perfect timing.